Painting by Peg Rowe, local artist. Kapiti Island is home to an internationally famed nature reserve protecting some of the world’s rarest and most endangered birds. The island is one of New Zealand’s most valuable nature reserves being the only large island sanctuary for birds between the Hauraki Gulf in the north and the most southern outlying islands. 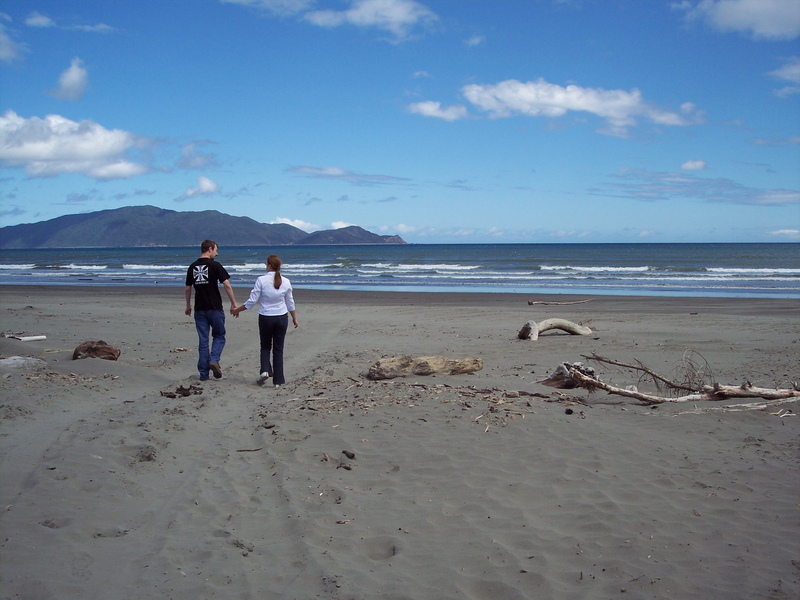 5km offshore and covering an area of 1965 hectares, Kapiti Island is 10km long and about 2km wide. The highest point, Tuteremoana, is 520m above sea level. Vegetation on the island today are Kohekohe, Tawa and Kanuka. Many parts of the island are covered in scrub which is dominated by Fivefinger, Mahoe and Kanuka. These are regenerating after the devastating clearance fires of the 1800s and earlier. The bird life is abundant, with Kaka, Kakariki, Robin, Saddleback, Stitchbird, Weka, Kereru, Bellbird, Kiwi and the very rare Takahe. A Marine Reserve lies adjacent to the Kapiti Island. Now I’m in a whole new world with you. The Kapiti Coast (formerly known as The Golden Coast) is the name of the section of the coast of the south-western North Island of New Zealand that is north of Wellington and opposite Kapiti Island. It falls under the jurisdiction of the Wellington Regional Council. The Kapiti Coast area has also made appearances in television and film. Peter Jackson (of Lord of the Rings and King Kong fame) is from Pukerua Bay and went to high school at Kapiti College in Raumati Beach. Scenes from both of the aforementioned movies have been filmed on the Kapiti Coast. During the filming of The Lord of the Rings: The Return of the King, some of the seminal battle scenes in the fields in front of Minas Tirith were shot in part at Queen Elizabeth Park. Kapiti Island figured in King Kong with the scenes approaching the lost island of King Kong shot in the waters between Raumati Beach and the island. The Tasman Sea is the large body of water between Australia and New Zealand, approximately 2,000 kilometres (1,200 mi) across. It extends 2,800 km (approx.) from north to south. It is a south-western segment of the South Pacific Ocean. The sea was named after the Dutch explorer Abel Janszoon Tasman, the first recorded European to encounter New Zealand and Tasmania. The British explorer Captain James Cook later extensively navigated the Tasman Sea in the 1770s as part of his first voyage of exploration. Pacific Ocean. West side of North island. New Zealand. To join in, create your own post about the ocean or marine life between now and next Friday, title it “Travel theme: Oceans” and put a link to this page in your blog post to make it easy for others to find your post.